This 4ft free-standing pavement Ice Cream point of sale model with flake is decorated with brown arround the outer edge of the Ice cream Whippy shape. 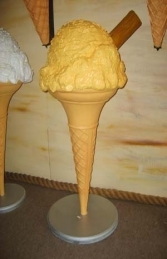 4ft, Waffle Cone, Whippy Ice Cream with Flake with Carpigiani style chocolate brown edging. The best Ice Cream models still at 2008 prices! 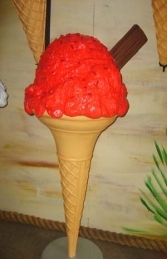 This 4ft high 3d Ice-cream display model with flake is also available in a wall mounted hanging version or in different edge colours to order.